AdjustmentListener Allows notification of Adjustment configuration or value changes. DrawStyle Provides drawing styles used by graphics and field objects. FieldChangeListener Listener interface for handling Field change events. FocusChangeListener Listener interface for handling changes in focus within fields. RotationListener Listener for rotation notifications. ScreenUiEngineAttachedListener Defines a listener for screen attach events. ScrollChangeListener Listener interface for handling scroll events in field managers. UiEngine Defines functionality for a user interface engine applications can use for their UI operations. Adjustment Abstract data structure used to establish a range of values and the step sizes contained within. Color Defines colors for convinience. ContextMenu A context menu that provides actions "appropriate" to the current field hierarchy. ConvenienceKeyUtilities A class used to programatically set an Application as the application to be launched upon a convenience key click. DrawTextParam Parameters used to control the drawing and measurement of text. DrawTextParam.AdvancedDrawTextParam Advanced text drawing parameters. Field Provides fundamental functionality for all field components. Font A font is a set of glyphs in a certain style and size, and an associated set of metrics describing their placement and overall size. FontFamily A font family is a collection of font faces (fonts of differing sizes and styles) which belong to the same typeface and are referred to by the same family name. FontManager FontManager handles loading and unloading of custom fonts for system-wide or application-specific use. FontMetrics The metrics of a font: that is, a typeface at a certain size and in a certain style. FontSpec FontSpec is a light weight class wrapping a few key Font parameters: font family, style, and height. Graphics Provides a surface on which applications can draw. KeypadUtil Provides keypad utility functionality. Manager Provides fundamental functionality for all field managers. MenuItem Represents an abstract menu item. Screen Base class for all screens. ScrollView This class provides fundamental scrolling functionality to all Managers. TextMetrics Metrics returned when drawing or measuring text. TouchEvent TouchEvent contains touch input events originating from the user that the application uses when overriding Field.touchEvent(net.rim.device.api.ui.TouchEvent) for customizing touch interaction behavior. TouchGesture TouchGesture represents a combination of basic touch input events originating from the user. Touchscreen Provides low-level access to the touchscreen on supported BlackBerry devices. Trackball Provides low-level access to trackball on supporting BlackBerry devices. TransitionContext The TransitionContext class contains all the necessary data to uniquely describe a transition animation between two screens. Ui Provides functionality and data global to the entire UI system. UiApplication Base class for all device applications that provide a user interface. UiEngineInstance User interface (UI) engine instance associated with an application or process, acquired by calling Ui.getUiEngineInstance(). VirtualKeyboard For supported devices with touchscreens, the virtual keyboard allows the user to type using the display in either SureType or QWERTY keyboard mode (depending on device orientation). XYDimension Represents a dimension on a two dimensional, cartesian plane. XYEdges Used to describe padding, borders, and margins. XYPoint Represents a point on a two dimensional, cartesian plane. XYRect Represents a two dimensional rectangle. Provides fundamental functionality for constructing the user interface of a RIM Device application. The members of this package are all abstract classes or interfaces and not intended for direct instantiation. You should rather use (or extend) the classes in net.rim.device.api.ui.component and net.rim.device.api.ui.container. In our basic interface architecture, the three main UI primitives are Field, Manager, and Screen. Fields represent rectangle areas that can be drawn; managers contain fields (managers are fields themselves, so they can be nested) and handle with layout and scrolling; screens are pushed onto and popped off a UiApplication object's display stack. Each application presenting an interface to the user owns at least one screen object, which in turn manages a number of other objects. The nearby diagram demonstrates a simple example, and would be used by an application to present a long list of items to the device's user. This application has one screen it presents to the user. The screen directly controls one, top-level vertical field manager (a special kind of field designed to manage and lay out a number of other fields, some of which may be field managers; the vertical field manager lays out its managed fields in a vertical list). 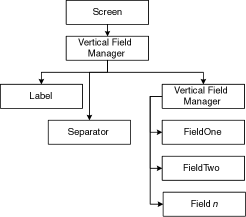 This particular screen's top-level field manager controls a label field (used to contain the visible title for the screen), a separator field (used to draw a line under the label title), and another vertical field manager (which controls and lays out an arbitrarily long list of field objects). Designing applications for RIM devices, especially those with a user interface, is not the same as designing traditional UIs for desktop computing environments. In order to provide a useful interface consistent with other applications running on the device, we suggest you consider the following guidelines when using our UI system. The user should always be in control of the application; here's principles to keep in mind that help achive user control. The user must be able to navigate and perform actions quickly. If long delays occur between the time the user performs an action and processing of the action, the user will not feel in control. Because users' preferences differ, users should have the ability to customize the interface (e.g., what information to display in the message list and the order in which information is displayed). However, the software should provide defaults that are helpful for the majority of users. The best interfaces are the ones that make the users' tasks easier, not draw attention to the interface. The best interfaces are the ones that are hardly noticed. An interface should be as intuitive and straightforward as possible. One of the best ways to achieve this is using the object-action paradigm. Users select objects and perform actions on them (e.g., user selects a mail message and reads it). Consistency should exist throughout each task in and between applications. The onus is on you, as a developer, to have an awareness of other applications being written for the device so that your application's interface is a consistent part of the whole. Consistency also allows for the reusability of common interface elements. Likewise, block operations should be like the operations were done individually. This is especially important if an operation fails in the middle (eg. paste into a nearly full buffer). The interface should be clear, not only from a visual point of view, but also from a conceptual point of view. Clarity is an especially important design aspect because RIM Handhelds have small interfaces. If the interface is jumpy (i.e., causes distractions by breaking visual flow), users may have trouble maintaining control. If using icons, keep in mind that they will be small and if they are cluttered, it will not be clear to the user how the icon is related to the interface at hand. RIM Handheld applications are not Windows applications! Do not fill the interface with a lot of controls. Too many controls will only emphasize the small size of the display. Dialog and status boxes should contain brief and concise text. This text should not merely indicate to users what they have done incorrectly; they should also indicate what action is necessary to correct the problem. RIM devices are two-way wireless devices - they are not a desktop solution. As such, device applications are not to be compared with Windows applications. Three-dimensional graphics or flashing cursors on the device display are inefficient and distracting. A simple design offers the best way to ensure that RIM Handheld applications are aesthetically pleasing. Keep the changing information on the display to one item, and keep the users' focus on one place at a time. When presenting a lot of information to users, ensure that the most important information is displayed first (e.g., when presenting each address book entry, display the name fields first, followed by the email address, phone, fax and pager numbers fields, and leave the Notes field to the end). Another way the UI system keeps the RIM device aesthetically pleasing is by taking advantage of the vertical nature of navigation. Menu items and lists are all presented in a vertical fashion. Double-clicking (as opposed to 2 quick single clicks) is not desirable based on the size of the device and the input devices. Feedback is the application's response to users' input (e.g., the appearance of a menu when users click or character display when users add information to a field). Immediate feedback is essential and the application should respond quickly to users' commands. For instance, one of the learning curves for new users of the RIM Handheld will be typing on the keyboard. Since keyboard typing may take a while to get used to, new users could become frustrated quickly if feedback from typing or invoking screens/dialogs/ menu is slow. The interface must allow users to change their mind and undo commands; essentially, it must be forgiving two classic instances of keeping the interface forgiving follow. First, users cannot be allowed to do anything destructive without being warned (eg. an action such as deleting a message or address book entry must be confirmed before the action occurs). However, be careful with over prompting; this can cause users to start ignoring all prompts, which is possibly even worse than not prompting in the first place. Second, common menu items are not close to others that undo the task at hand (eg. the Cancel menu item is not close to the Hide menu menu item). Every screen will have a title on the first line of the display. The title line should be a repository not only to inform the users where they are, but also to display brief information to help the users with the particular task at hand. For example, when users perform a search in the address book application, the screen's first line will display the screen title plus the text typed to invoke a search. Controls are tools such as icons and buttons that the user selects to issue commands. Keep the number of controls on the display at any one time as small as possible. Too many controls on the display will only emphasize the small size of the display. As much as possible, try to keep the user from having to flip back and forth between the keyboard and the trackball (if present). For example, if the user is entering data using the keyboard, he should not have to use the trackball for some form of input and then go back to using the keyboard. The consequence of this is that most actions should be possible from both the keyboard and the trackball. Quite often, users will overshoot with the trackball or accidentally click it while rolling. This has two ramifications:forgiveness principles should take this into account; menu items and dialogs should not be grouped in such a way to cause the user to accidentally do something destructive. When encountering error conditions, the user should be informed without being inconvinienced. Attempts should be made to make the failure graceful, that is so that no information is lost. For example, if inserting in the middle of a full field, it is better to not allow further input (and display a brief error status message than to throw out characters at the end of the buffer without warning.